Indication are that presidential candidates of all the political parties will engage in a debate on national television before the general election in December, this year. The Institute of Economic Affairs (IEA) and the Ghana Broadcasting Corporation (GBC), are holding discussions on the modalities for the “face-to-face” meant to expose the candidates to the electorate. Mr Kwesi Jonah, the acting Head of the Governance Centre of the IEA, who disclosed this in an interview, said the key objective of the presidential debate is to give Ghanaians the opportunity to listen to the candidates and what they can do for the country if elected president. He said in the past, the only opportunity available to the electorate to access the candidates was their public appearances at rallies organised by the parties. According to Mr Jonah, those rallies did not adequately expose the capabilities of the candidates since space and airtime constraints restricted their interactions with the public. He said for the first time, the “face-to-face” would create the platform for all Ghanaians to listen to the candidates at the same time on national television and how they will respond to questions.Mr Jonah could not say the number of times that the “face-to-face” would be organised but expressed the hope that one presidential debate would be put together very close to the general election in December. He was optimistic that the political parties would co-operate with the IEA to make the exercise successful and offer the opportunity to the electorate to properly access their presidential candidates. He gave the assurance that the IEA and GBC would wrap up the discussions very soon to make the concept a reality. 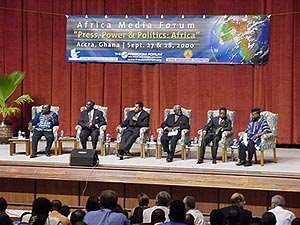 Prior to the 2000 elections,the Ghana Journalists Association(GJA), in collaboration with the Freedom Forum of the United States of America organised a 'face-to-face' for the presidential candidates. All the presidential candidates participated except Professor John Evans Atta Mills, presidential candidate of the National Democratic Congress(NDC) who cited busy national schedules for his inability to participate. President J.A. Kufuor, then presidential candidate of the NPP, Professor George Hagan of the CPP, Dr. Charles Wereko-Brobby of the UGM, Dr Edward Mahama of the PNC, Mr Dan Lartey of the GCPP and Mr Goosie Tanoh of the NRP participated in the debate.